Review and unboxing of the Velocity Yoyo. 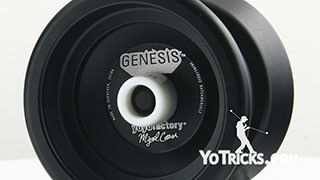 Velocity Yoyo Review Yoyo TrickThis is the YoYoFactory Velocity, and as you can see, if you get it from us you get it in our small box. You may not know this, if you get yoyos in our small box, they are actually easier to get out if you open them from the bottom. 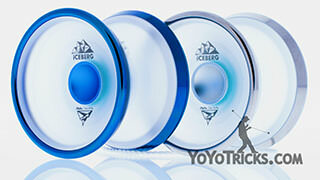 Then all you need to do is grab onto the yoyo and you can push it right through the bottom. Our small box, as you can see, it also comes with string that you can put right onto the yoyo. 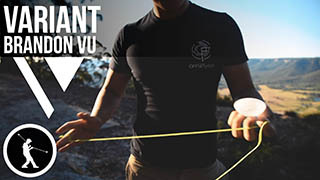 The Velocity, you just put the string on just like you do most other yoyos. You get the end of the string and untwist it, and you put it right onto the yoyo and you are good to go. If you need more help with that, or if you want more details about the process, we have a video called Replacing the String, and another video called Adjusting the String that you will want to take a look at. When you take a look at the Velocity, you can see that it has kind of a classic shape. It is more rounded, but it is also flared out. 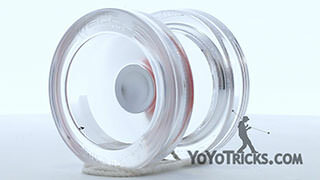 What that means is that it is not going to be the best yoyo for looping tricks, because looping yoyos tend to have higher side-walls and are a little bit more narrow. 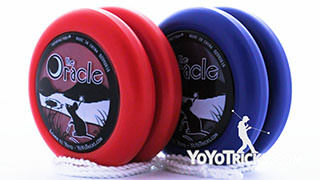 Compared to a lot more modern shapes, it is not quite as good for string tricks (either) because those yoyos are wider. 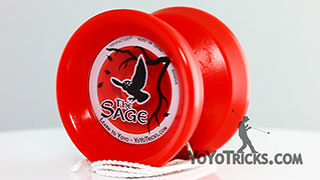 This yoyo is really right in the middle of the pack, it wants to be pretty good at both styles, and it kind of achieves that. 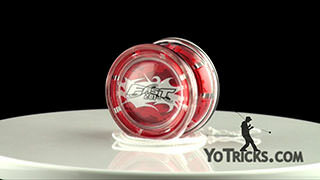 At the same time, if you are looking to get into one style the question is, why would anybody want to get this yoyo. There is a very good reason, especially if you are a very particular type of player. The neat thing about the Velocity, it is the only yoyo we carry that can go from responsive to unresponsive play without swapping out the bearing, or without taking the yoyo apart. If you are not quite sure what I mean by that, we will talk about that when I do a demonstration with this yoyo I am done showing the yoyo to you. 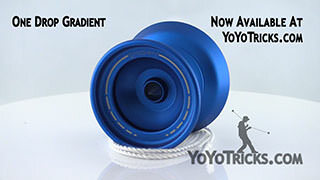 If you are the type of player who is just getting into yo-yoing and you have seen some of the advanced unresponsive tricks and those are really inspirational to you, but also a little intimidating then you might want to consider the Velocity because you can get the Velocity and you can set it to an easy mode where it plays responsive and the yoyo will come back up and you can learn all the basics, and then any time you are ready to move on to unresponsive play you can change this dial and it will go into unresponsive mode, and you can work on those tricks. If you get frustrated you can always just change it right back. 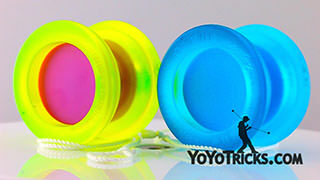 This yoyo can change between those faster than any yoyo we have and, like we said, you do not have to swap any bearings or any parts, and you do not have to take the yoyo apart. It is a pretty neat design. Because of that we also feel like it is a really great gift. 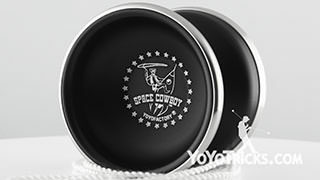 If you have someone that you think is going to be really into yoyos and you are not quite sure what yoyo to get them, you really can’t lose with this yoyo. If you get it for them and they are super coordinated, then they can just set it to pro mode and they can learn all the most advanced tricks. If they need a little bit more help they can set it into easy mode and they will have a yoyo that plays easy and responsive and they can learn the basics. I have been talking about using Pro Mode, what I am talking about is this dial on the yoyo. You can see that one way you turn it, it goes into Easy Mode, and the other way you turn it, it goes into Pro Mode. 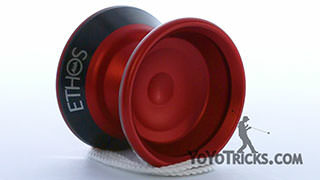 What that dial adjusts are the response pads on the inside of the yoyo. Right now it is set to Pro Mode, and the response pads are fully out, but if I just turn it a little bit, if you look on the inside of the yoyo you can see that the response pad is starting to come out just a little bit. 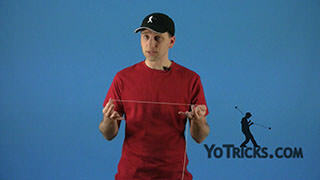 If you do that on both sides it effectively narrows the gap of the yoyo and makes the yoyo play easy and responsive. 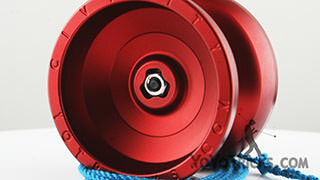 That is what makes this yoyo so innovative, that dial system that can handle that. 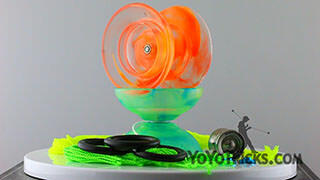 Let me take the yoyo apart so you can see a little bit better what I am talking about. 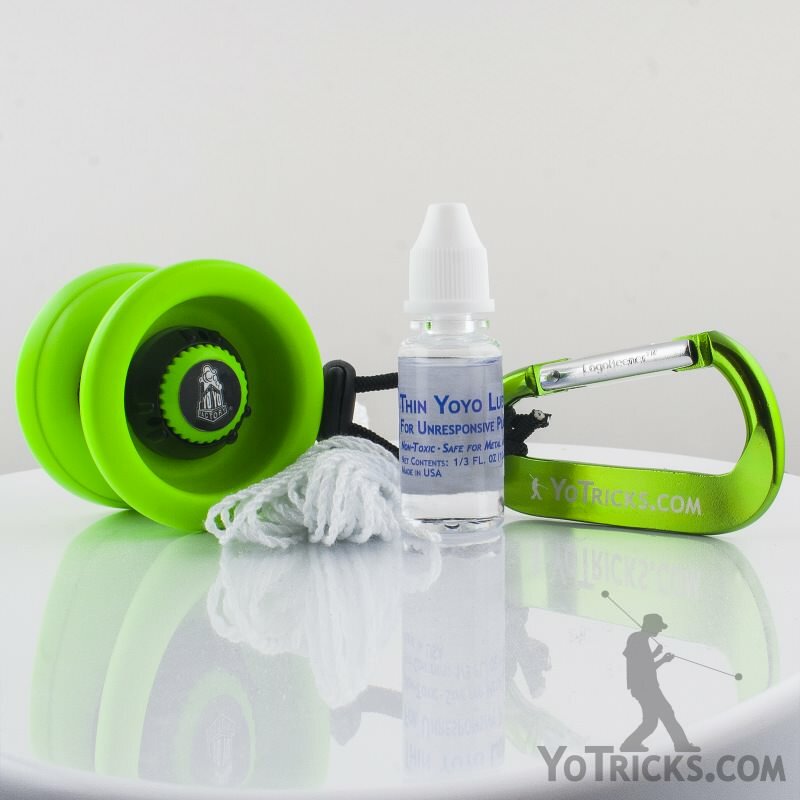 When you take the yoyo apart you can see the response pad area is here. It does take standard 19mm response pads if you ever need to replace those. If you look at the yoyo you can see that it has the bearing in the center and then the spacer right here. At first the spacer can seem really hard to pull off, actually if you just stick your thumbnail in between the spacer and the yoyo and work your way around the bearing that spacer should come right off. If it does not come right off you can get a sharp knife or something, of course be careful, and you can pry that away from the bearing. That will work as well. If you look at the spacer what you will see that one side is a little bit longer, and the other side is shorter. The longer side goes into the yoyo, and the shorter side fits into the bearing. You want to make sure that you do not get that wrong, because if you put the long side into the bearing the yoyo might not go together right, you will probably have a hard time getting the spacer back off and it can cause you a lot of unnecessary frustration. So make sure that you get that in there right. 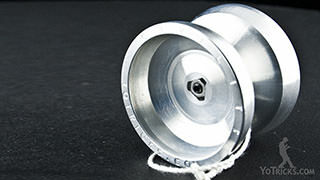 The bearing in this yoyo is a type A bearing, which is smaller than a lot of yoyos, but it still sleeps a really long time. The way that we test yoyos, is we throw a sleeper and if it sleeps up to three minutes then we just stop counting because at that point what does it really matter if it can sleep longer than that? What tricks take longer than three minutes to perform? 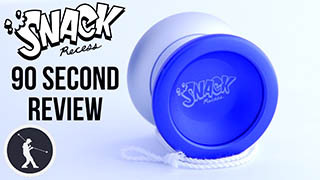 We found that with a straight and powerful throw this yoyo did sleep over 3 minutes, so you can still do tons of tricks with it. 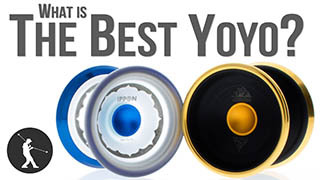 What we would say about the bearing is that you do want to lube it with thin yoyo lube, and that will allow the yoyo to keep playing the way that you want, and it will allow the bearing to last quite a bit longer. We have another video about how to lube bearings, so you want to check that out before you do that. 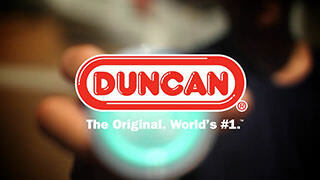 We also have a pack that includes thin lube, so you may want to consider picking that up if this is your first yoyo. Like I said, you have this dial here, you can see when the yoyo is apart a little bit easier that if you start to put it more to easy mode that the response pad pushes out a little bit. You can make it come out so far that this piece will actually come right out of the yoyo, you can see the threads there that make it work. If you want to get that back into the yoyo you just push it back into place, and if you push down a little bit it will snap back into place, and once it is level you can dial it back into pro mode and pull that back into the yoyo. Let me put the yoyo back together, and I will show you how that works in practice. 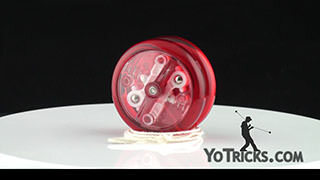 You can see there are dials on both sides, and when you adjust the yoyo you want to adjust it evenly. You can turn this one to easy a little bit and get the response pad to come out a little bit. Then turn it over and turn it to easy a little bit until they look like they are even. When you first get this yoyo they may be a little bit hard to turn, but that is okay, you can really force them and eventually they will loosen up. You will find that they are pretty easy to turn over time. Another thing, you can actually push this response pad out so far that it touches the response pad on the other side. If you do that the yoyo won’t sleep at all. What you are going to find is you are going to need to fiddle with it a little bit and find just the right place where the yoyo has the level of response that you want. Then you can play with it and once you want to go back into pro mode you can just twist it to pro on both sides and the yoyo will play perfectly unresponsive. 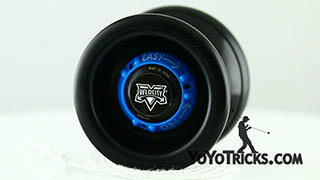 That is the Velocity yoyo, let’s see how it actually plays. When you first get your Velocity it is going to be set to Pro Mode, which means it is going to play unresponsive. Like I said, if you do not know what that is, that just means that when you tug on the yoyo it is not going to come back, and you are going to need to learn how to Bind it to get the yoyo back. If you are a new player one of the first things you are going to want to do is adjust it to play responsive. Like I said in the previous portion of the video you just dial these in a little bit to easy mode. You may have noticed that I got the string out of the gap of the yoyo. It is almost always better if you are going to make a major adjustment to get the string out of the gap. Otherwise, the string might get caught in there a little bit on your first throw and it will come back unexpected, and you don’t want that to happen. I am going to adjust the string, and then I am going to wind it up to see how it plays. Now it is coming back perfectly responsive but it is a little bit too grippy for me. I am just going to make a tiny adjustment here on both sides to set it a little bit more to pro to see how that plays. That feels a little bit better. If you want to further test it you can also land the yoyo on the string. Right now it is playing really, really well. If it is a tiny bit too tight you will feel the response pads gripping onto the string. 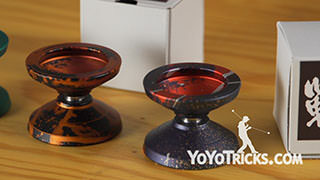 The yoyo will feel like it is going to come back when you don’t want it to. You can see right now the yoyo can land on the string, I can do a lot of different string tricks without any problems, the yoyo comes back with just the slightest tug. 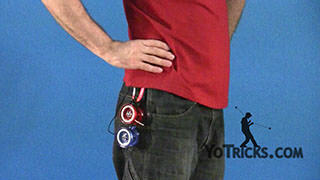 When it is setup this way you can also do flips like this, of all kinds, the yoyo – because it is a wider shape – it actually does those really well. Then you can pull it right back when you are ready. When you want to move up to unresponsive play, same thing, remove the string out of there and set it completely to Pro Mode. This is the way the yoyo is going to sleep the longest because the response pads are not interfering with the string. To get that back I am going to have to perform a bind, just like that. 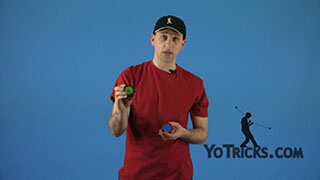 In Pro Mode, as you know, because the yoyo is now unresponsive, you can do different unresponsive tricks like this, and of course you will always need to bind the yoyo to get it to come back. 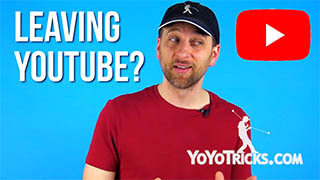 You can get into some pretty complicated different tricks where you are loading a lot of different strings into the yoyo and, yeah, overall it plays pretty well. You may hear that the bearing is already starting to make a little bit of noise, again, if that happens, that is when you will want to lube the bearing. You can really explore a lot of the fundamentals of unresponsive play once you get the yoyo into Pro Mode. Again, at any point if you are getting frustrated or if the bind is not working for you, or if you want to give it to a friend and have them try it out and have it be easy, just set it to Easy Mode and you are good to go. We do recommend that you consider getting it in the pack so that you can get that thin lube. 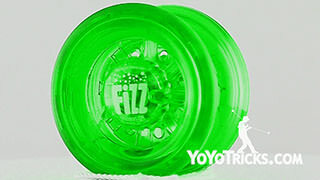 If it is your first yoyo and you don’t already have that it will help the yoyo last quite a bit longer. 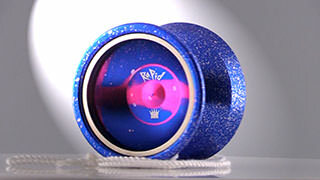 That is the Velocity yoyo.